Patients develop human African trypanosomiasis (HAT) only after visiting rural areas of sub-Saharan Africa. A painful chancre may develop at the site of a Tsetse fly bite. A targetoid macular trypanid (Figure 1) may accompany or follow intermittent high fevers. Patients with the Eastern or Rhodesian form of HAT develop sleep disturbances, neurologic problems, and deep delayed hyperesthesia within weeks or a few months of exposure. In 70-80% of Eastern HAT patients, a painful, indurated, violaceous chancre measuring 2-5cm in diameter develops at the bite site 5-15 days after inoculation (Figure 2, Figure 3). The chancre ulcerates, forms an eschar, and heals by 3 weeks after its appearance. Chancres are rare in Western HAT. Trypanosomes multiply in the chancre and then spread to draining lymph nodes. Example of a indurated chancre that will develop in the site of the inoculation. Western HAT may be asymptomatic for months to over a year, while Eastern HAT victims typically develop hemolymphatic (early or stage I) disease as the chancre heals. Stage I disease due to multiplication of parasites in the blood and lymph nodes is characterized by intermittent fevers (40-41oC), pruritus, malaise, myalgias, arthralgias, lymphadenopathy, and occasional hepatosplenomegaly. Signs and symptoms are more severe in non-native patients. The most specific stage I sign is the trypanid, a macular, targetoid, erythematous eruption that occurs 6-8 weeks following onset of illness (Figure 4). As the trypanid resolves, it reveals underlying purpura (Figure 5). Another example of macular targetoid ertythematous eruption that occurs at the outset. Purpura residual after the trypanid resolves. Visible lymphadenopathy tends to involve the posterior cervical (Winterbottom’s sign) and supraclavlcular nodes in Western HAT and the axillary and epitrochlear nodes in Eastern HAT. Cutaneous findings include localized facial edema, petechiae, erythema nodosum, ichthyosis, and purpura. Trypanid histology is nonspecific. 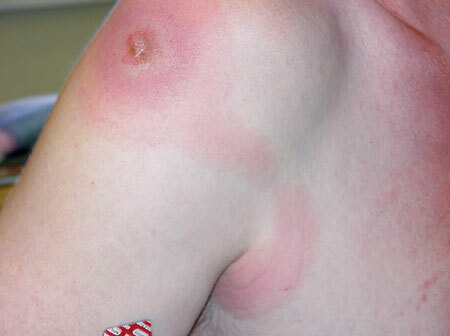 The leading edge of a targetoid lesion reveals lymphocytic spongiosis and superficial perivascular lymphocytic infiltrates (Figure 6). The center of a targetoid lesion demonstrates lymphocytic spongiosis, a superficial perivascular lymphocytic infiltrate, neutrophils, and leukocytoclasia (Figure 7, Figure 8). Trypanosomes are not found in trypanid biopsies. Superficial perivascular lymphocytic infiltrate with lymphocytic spongiosis. Biopsy from center of targetoid area showing spongiosis, and superficial perivascular lymphcytic infiltrate with admixed neutrophils and leukocytoclasia. Trypanosomes rapidly change their variant surface glycoprotein coat to evade the host immune system. The Western gambiense parasite is less efficient at this antigenic change, and this may explain why Western HAT progresses more slowly than Eastern HAT. Diagnosis requires demonstration of trypanosomes in a Giemsa-stained blood smear or a lymph node aspirate. Slides must be reviewed within 20 minutes of obtaining samples, since the trypanosomes easily lyse. Because the Eastern Rhodesian form of disease is more virulent, the 15-30 micron, flagellated trypanosomes are easily found on a routine blood smear. Finding parasites in Western HAT patients often requires concentration of the blood to form buffy coats. Every patient with HAT must have a lumbar puncture performed for staging purposes. To avoid transferring trypanosomes from the blood during the procedure, it is best to wait 24 hours after initiating therapy for stage I disease so that parasite blood levels significantly drop. Organisms are difficult to find in cerebrospinal fluid (CSF). In the absence of parasites, a positive CSF is characterized by finding more than five leukocytes per microliter, a protein level above 370mg/L, or the presence of high levels of IgM. Occasionally, Mott cells are found. These are large eosinophilic plasma cells which have not disgorged their large quantities of IgM. Rodent inoculation with CSF can also prove the presence of trypanosomes. The most common cause of a chancre-like lesion in a traveler to Africa is a furuncle due to Staphylococcus aureus or Streptococcus. The most common cause of fever in a hospitalized patient recently returning from Africa is malaria, and a blood smear is necessary for diagnosis. Western (Gambian) HAT develops in western and central Africa, while Eastern (Rhodesian) HAT occurs in eastern and southern Africa. As of 2009, only 18 countries reported new cases of HAT, and over 70% were due to Western HAT in the Democratic Republic of the Congo (DRC). Only the DRC and the Central African Republic reported more than 1000 cases per year, and only four other countries (Angola, Chad, Sudan, and Uganda) reported 100-1000 cases per year. Western HAT accounts for over 95% of cases. Total cases decreased from about 38,000 in 1998 to less than 10,000 in 2009. The World Health Organization official estimate of 30,000 new cases annually assumes a threefold underreporting error. Urban area travelers and citizens are not at risk for HAT. People contract western HAT in poor, remote rural areas while fishing, hunting, farming, and washing clothes. Eastern HAT develops among hunters, game wardens, and tourists on safari in game parks, particularly in Tanzania, but also in Botswana, Rwanda, Kenya, and Malawi. Western HAT is rare in short-term tourists. The United States has averaged about one case of HAT per year for the last 40 years, and 90% of patients had the Eastern form. Two morphologically identical subspecies of the unicellular protozoan parasite Trypanosoma brucei cause HAT: T. b. gambiense causes the Western form and T. b. rhodesiense causes the Eastern form. Parasites are transmitted by tsetse flies of the genus Glossina. Humans serve as the primary reservoir for T. b. gambiense, and cattle are the primary reservoir of T. b. rhodesiense. Both forms follow a painful tsetse fly bite. Both male and female flies bite during daylight and are attracted to dark and bright clothing; neutral-colored clothing that covers to the ankles and wrists is recommended. Untreated stage I patients develop central nervous system (CNS) (late or stage II) disease. Trypanosomes actively cross the blood-brain barrier within weeks to a few months in Eastern disease and after months to years in Western HAT. Patients with CNS disease complain of severe headaches, disturbed sleep, and daytime somnolence. The most specific sign of stage II is Kerandel’s deep delayed hyperesthesia: delayed pain out of proportion to the stimulus following a sharp squeeze or blow to the soft tissues. Other signs include tremor, fasciculations, general weakness, limb paralysis, hemiparesis, akinesia, Parkinsonian behavior, psychoses, or abnormal movements. Coma and death ensue within a few months (Eastern HAT) or 3 years (Western HAT) without treatment. Optimal treatments for HAT are summarized in Table I. As soon as you have diagnosed a patient with HAT, call the Centers for Disease Control and Prevention in Atlanta (CDC, if you live in the United States) or the World Health Organization (WHO, outside the United States). One of these organizations will get you the medication you need and explain how to give it to your patient. In 2009, the WHO added a second option for Stage II Western HAT that combines eflornithine and nifurtimox so that the frequency of dosing is decreased and the efficacy is increased. Eflornithine does not work in Eastern HAT. Do not manage a patient with HAT without consulting the expertise of the CDC or the WHO. Except for pentamidine, the necessary medications are only available at the CDC in the United States. The WHO and a few tropical medicine hospitals possess the medications in other parts of the world. Suramin should not be used in Western HAT patients who often have onchocerciasis. Suramin lyses Onchocerca organisms so well that a florid allergic reaction may ensue. Adverse reactions to suramin are frequent, but usually mild and reversible. These include nephrotoxicity, peripheral neuropathy, and bone marrow toxicity. Melarsoprol is an arsenic compound that causes many adverse reactions. An encephalopathic syndrome with a case-fatality rate of about 50% develops in 5% of Western and 8% of Eastern HAT patients. Dexamethasone and diazepam are used to treat this syndrome. Other reactions to melarsoprol include pruritus, morbilliform eruptions, and sensory and motor neuropathies. The propylene glycol solvent melts plastic syringes and together the solvent and drug cause phlebitis. Fever, vomiting, and diarrhea round out the common side effects. Pentamidine is usually well-tolerated, but intramuscular injections can cause sterile abscesses, and patients may complain of abdominal pain and develop hypoglycemia. Eflornithine, released in 1990, is the only antirypanosomal medication developed since the 1940s. Bone marrow toxicity occurs in 25-50%, gastrointestinal symptoms in 10-40%, and seizures in 7%. Treatment and management follow a cookbook protocol. Intensive care unit support with intubation is sometimes required to prevent aspiration during CNS disease. Physicians must exclude more common causes of travel-related illness. The most common cause of a chancre-like lesion is a furuncle due to Staphylococcus aureus or streptococci. Culture and gram stain should be performed. Malaria is the most common diagnosis in a hospitalized patient with fever who recently traveled to Africa. Blood smears will help to diagnose this. Other less common causes of fevers in travelers include typhoid and paratyphoid fevers, dengue fever, borreliosis (relapsing fever), arbovirus infections, and rickettsiosis.